3/4 t amla powder (optional) - Watch Dr. Greger's videos about why to include this! 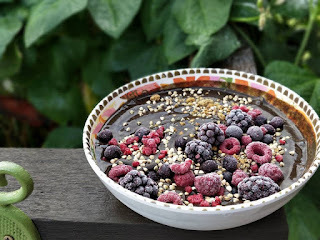 Blend the water, greens, blueberries, cacoa/cocoa powder, and flaxseeds (plus date and amla powder) until well combined, smooth but still thick. Pour into a bowl and top with frozen berries, chopped walnuts, and buckwheat groats.